The Mayor trumpets the start of the race! 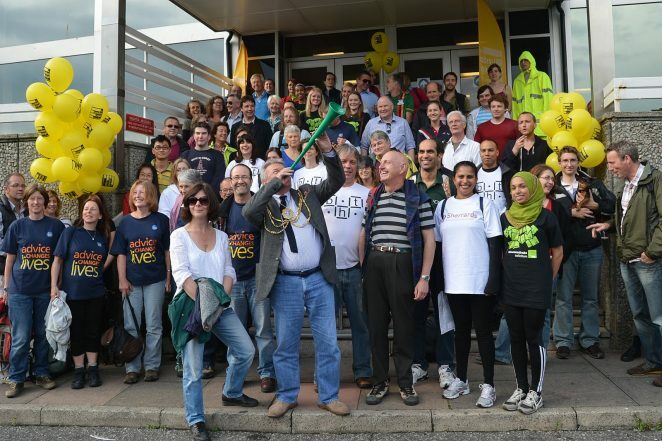 The Mayor of Brighton and Hove, Councillor Bill Randall, visited Brighton Magistrates Court this week to lend his support to the 5th Annual Brighton and Hove Legal Walk. Over 100 walkers, led by District Judge Pollard, braved the midsummer downpours to walk 10km around the City. The event was expected to raise over £4,000 for four local advice charities that provide much needed free legal advice to residents in financial difficulty: BHT, MACS, Brighton Hove CAB and the Fed. Walkers from the advice agencies were joined by teams from across the legal profession including 1 Crown Office Row, Westgate Chambers, Bishop & Light, DMH Stallard, Family Law Partners, Sherrards solicitors and Stevensdrake solicitors. And there was a small group of staff and residents from BHT phase one project (supported housing) giving something back because we’ve needed the services before.